If you are working on an older car, or you want to cut costs after a crash, knowing a bit about panel beating can be very useful. But be warned – this story does not aim to bring you up to the standard of a professional! That’s because to work at anything like a professional panel beater, you need literally years of experience. In fact, I remember when I worked as a floor-sweeper in a prestige panel-beating shop. Over a few days, I watched an expert completely beat back into shape the front ‘guard of a Mercedes SLK – it went from a crinkled wreck to being the perfectly-formed, compound-curved shape of the original. To watch the transformation, achieved only with a hammer and dolly, was breathtaking. That was the work of a professional - but at our end of the skill spectrum, with a few tips and some practice, you will be able to reshape slightly dented panels. When I started trying to shape metal, I used all the wrong tools - like a ball-pein hammer and a carpenter’s claw hammer. I bashed away, forming dents in the metal that in fact made the imperfections worse, not better. So the first rule is to buy the right tools. 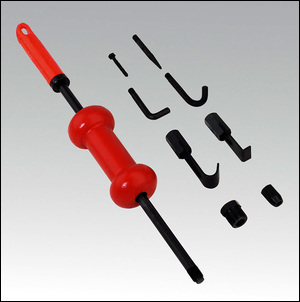 At its cheapest and simplest, buy a panel-beating set comprising a number of hammers (three is good) and some dollies. The hammers will be shaped and weighted to produce only small deflections in the metal with each blow (they’ll be light and have heads that typically are slightly curved in end form) and the dollies will have different shapes to match different panel profiles. You should pay under $50 for the set – for an amateur, it’s not worth spending hundreds of dollars on a professional level kit. Other tools that will probably be necessary include some pieces of hardwood that can be shaped to access difficult spaces, and some smooth lumps of steel that can act as dollies when, again, you’re trying to work in difficult spots or with panels that don’t match the available dolly shapes. For many panel repairs, you’ll also need a comfortable low seat (I use an upturned milk crate with a cushion) and ear protectors. If you’re dealing with a panel that has been dented so much that the metal has been stretched, an oxy-acetylene welding kit will allow you to shrink these deformed areas, and also to anneal (soften) metal that has work-hardened. Finally, if you cannot access the rear of the panel, you may need a slide hammer to pull dents out. To temporarily attach the hammer to the panel, you can drill small holes and screw in a self-tapping fitting, or you can use the oxy to braze a screw to the panel and then pull on the head. The most important panel-beating skill is to develop a proficiency in using the combination of a hammer and dolly. In use, the polished face of the dolly is held firmly against one side of the panel and the hammer is used from the other side. But the hammer-and-dolly can be used in two quite different ways. 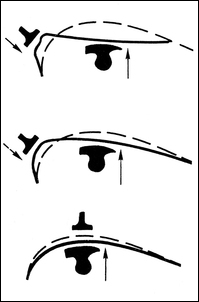 In the first approach, the hammer head hits the panel in the middle of the dolly. 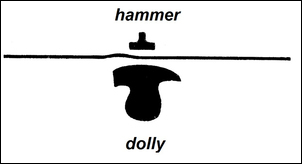 That is, the metal is sandwiched between the hammer head and dolly. This is called ‘on dolly’ work. So when is this approach taken? The other approach is called ‘off dolly’. 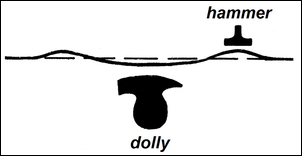 In this method, the hammer hits the metal slightly to one side of the dolly. In other words, you ‘miss’ the dolly entirely. However, note that you miss the dolly typically by only a small amount. With off-dolly work, the metal is no longer sandwiched between the dolly and hammer. 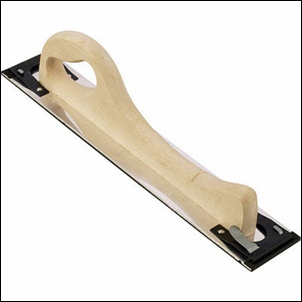 Instead, the dolly is used to stabilise the panel and the hammer is used to push the metal back into shape. Imagine that you have a largish depression in the panel. By working off-dolly you can push the metal back into roughly the correct form – with both the dolly and the hammer doing the pushing. After the large depression is mostly fixed, by working on-dolly you can shape it to exactly the correct profile. For a beginner, the most important ingredient in panel beating is patience. To progressively remove even a small dent requires many light blows of the hammer. Don’t think of it as needing five or ten medium-hard hits; instead expect to use 50 or 100 light taps. When you are using the hammer, concentrate on the feel and sound the hammer makes as it hits the metal. The sound and feel of the hammer blows will also vary with how hard you are pushing the dolly against the panel. If you push less hard with the dolly, so that it bounces off the metal slightly with each hammer impact, you will progressively push the panel away from the hammer – at the same time as you are also forming the metal to match the dolly profile. If you push really hard with the dolly, you can progressively move the panel in the direction of the hammer. When working off-dolly, you typically want to miss the dolly by only a small amount. (If you miss the dolly by a long way, it becomes akin to working without a dolly – and you’ll much more easily stretch the metal.) The feel and sound of the hammer blows, together with the reaction through the hand holding the dolly, will tell you how close you are working to the dolly. Be very careful if you don’t have the tools to shrink the metal (typically by heating with an oxy-acetylene kit). In that case, getting over-enthusiastic can stretch the metal in the opposite direction to the dent – and without the oxy (or a special shrinking dolly), there’s no easy way of remedying the mistake. A beginner will often not know exactly where they’re going. Yes, they’re working off-dolly, but is the panel moving in the right direction? At the stage where you’re trying to get the panel roughly back into the required shape, run your hand back and forth across it. This will give you a feel of the large high and low areas. 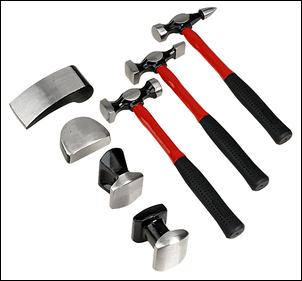 Work with many light hammer blows until you can no longer feel large depressions or protrusions. The next stage in assessing where you are going is to use a paint marker coat and a straight sanding board. The paint can be from any old spray can that has contrasting colour paint – just give the working area a faint spray, let it dry for a few minutes, and then use the flat sanding board to go over the area. Use the long sanding board to follow the curves (they’re normally convex so you can do this) and you will then immediately see the location of the low areas (no paint removed) and the high areas (paint rubbed off). You are always aiming to remove as little metal as possible, so it’s the knocking down of the high areas which are most important. When you get to the stage that the panel is nearly the right shape, use the pick point of a body hammer to very gently tap down these high points. You may have started with the idea that you’re going to shape every panel to the point of metal finishing (that is, no filler needed at all) but if you’re anything like me, you’ll find that last step damn-near impossible. Instead, aim to have the surface within (say) 0.5mm of perfect. On most panels, using a straight edge will let you assess this. That final step towards a dead-smooth panel will be achieved with body filler. Don’t be tempted to use a flap or disc sander to remove those last tiny dents – if the panel is 1mm thick and you’ve got it within 0.5mm of correct, sanding it smooth will mean you’ve just halved the thickness of your panel! Lots of people will tell you to practice on old panels from the wreckers. But to be honest, I think that this can be more difficult than working on the actual car! That’s because in most ‘real car’ panel beating, the panel is part of the car and so is well supported. Chasing a practice panel around the bench is no fun at all, and the panel also reacts differently because it is unsupported at the edges. Instead, go for it on a real car, but start off somewhere where a lower finish is acceptable – say under the body or in a spot that is not obvious. But take it really, really slowly. The more slowly you shape the metal, the earlier the warning if you’re going wrong. 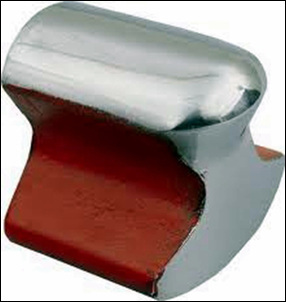 Don’t forget that on thin body panels, every single blow of the hammer (no matter how light) is moving the metal someplace – you need to be watching and aware of where that movement is occurring. Finally, be patient and use many very light blows of the hammer!